Whether they have learned anything?? With members of HKMTB.COM we met them on Jan 19 at Legco. In addition to the usual suspects from Tai Lam and Lantau they had very senior AFCD people there as well. Near the end, they agreed to meet us again before CNY to discuss THEIR trail proposals which is based on proposals provided to them by the HKMBA and other sources. We were told that we would receive them two weeks prior so that we could do our assessment. Will the AFCD honour their pledge to discuss trail openings before CNY? What ever happened to the trip to Whistler by the AFCD? Did anything ever come out of it? The period is 4 months! Aug 1st to Nov 30th. Not sure who this quote is attributed to: "there are lies, damned lies and statistics!" I watched the proceeding of the Marine and Country Parks Board meeting last week with Kenneth and the Board completely skipped past the stats except to talk up the 22% increase in visitors. When the topic of the new marine geo park came up and someone mentioned that a CLP wind farm would be built nearby, one board member hastily said "Let's block that!" but was then told that the CLP wind farm already has govt approval... it was interesting to observe this man's knee jerk reaction to a clean, renewable form of energy that is actually good for the environment and country parks... or maybe he was worried about the loss of CO2 that is needed by plants and tree in country parks. In that case he's correct. Symbolism is out, stats are in. Be happy to know that the AFCD made 57 prosecutions in regards to Illegal Entry of Bicycle under the related ordinances between Aug 1 and Nov 30, 2009. Dont ask me how the AFCD come up with these numbers but here is where the stats get a bit crazy. They had 5,038,000 visitors during Aug 1-Nov 30, 2009 and they gave "advice" to a total of 198,401 visitors. This breaks down as follows: Littering (198.016), Polluting water course (22), Illegal Cycling (53), Illegal entry of vehicle (150), Others (160). Okay, so this works out to giving "advice" to 4% of all country park visitors. Either the AFCD's numbers are completely wrong or these people have some kind of Obsessive Compulsive Disorder and prefer upholding rules than conservation. That's as if the police stop one vehicle in every 25 on the roads all day long. Mountain biking is growing very rapidly. All the trails in Tai Lam Country Park is an open invitation for good riding. The riders and the AFCD knows about it. The AFCD symbolically raises pillars (like the one in Kap Long entrance) and the no biking signs on those trails to remind us we are in illegal sectors. These action are not intented to riders from entering, but it is just a symbol. The sub text is, we need to respect those symbols by not tampering with it. Leave it there and ride on. THe AFCD sees the big rock jump as our symbol. We knock off the a sign or up root a post, they will dismantle stuff made by bikers. This is the hidden balance between these two forces. There is also a balance between hikers and riders. This is even easier to maintain. Just say hi to them with a dash of good morning or good afternoon will do the job. The AFCD follks are not park rangers nor people especially interested in nature and wild life. Most of them are just people who likes to do very little and get thier paid as easily as possible. They are only motivated to do stuff when their ego is challegned. Apparently the local Civet cats are tired of the diet of berries provided by the exotic trees so they campaigned to get the old, dying, exotic trees with unpalatable berries replaced with newer trees with tastier berries. Expect a more robust brew at the local coffee house soon. seeds could be used as herbal medicine to improve blood circulation. Its nice too see an AFCD Officer is concerned about health matters for a change but too bad that its illegal to pick the seeds from the trees in country parks... no matter, I prefer to ride my bike for improved blood circulation. Last edit: 9 years 3 months ago by tom. Last Wed I went to TMS and saw these guys building a fence behind the bus station thus blocking access to this little path. I thought they were doing it to stop people from riding down. But as I confront the AFCD official, he freaked out. He said the purpose of this fence is not to stop you people from riding down, but to stop garbage blowing into the park. I apologies and all was well. The next Sunday I was there again and saw the fence was ripped open at the entrance of this little path. Access was achieved and some folks were riding down it. This pass Wed I was there again (oh yes business have been slow and I tend to ride like if I won the lottery or something). To my surprise, AFCD had cut down this big old beautiful tree beside the path and its great trunk lies right across the path blocking access for good. So I ask what is the logic behind this? The fence was build for a reason, stopping garbage from entering park area. The fence was damaged, most likely by MTBers from the AFCD point of view. 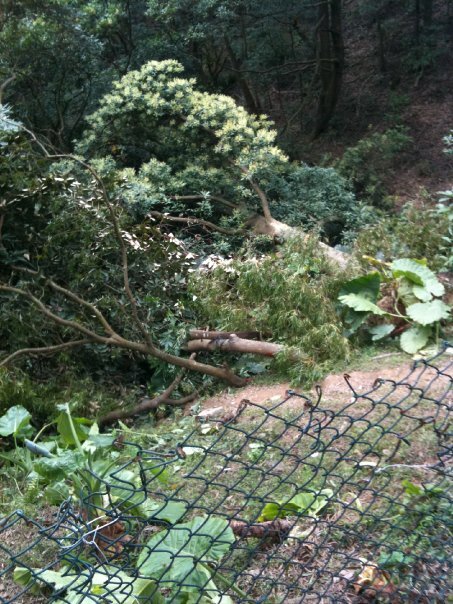 Cutting down this big tree will stop MTBers from damaging the fence. The fence then is more precious and valuable then the tree which had been their from many years. No, this is the Chinese way. The fence is only a symbol of face. When face is freaten all other issues are compromised. Even though the main duty for AFCD is to protect the enviroment they will not blink an eye to cut down a tree to preserve this face symbol. The more MTB folks challegne thier action/policy, the harder they will be upon MTBer whether these challegnes are legit or not. Last edit: 9 years 3 months ago by ratcat.